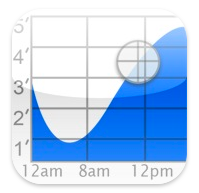 The Tide Graph App by Brainwave uses the harmonic predictions from thousands of US coastal stations to give you great tide charts. You also get a graph that shows sunrise, sunset, moonrise, moonset, and moon phase. This iPhone App, available in the iTunes store, is great for boaters and fishermen alike.